Information on this subject is extremely scattered. Please contact us if you have any further information or corrections. In 1907 the Germans invented a “taximeter” that allowed drivers to know how much to charge for a ride. Soon it was shortened to “taxi,” and referred to any kind of cab: “growler,” hansom, and auto. In 1918 an ordinance was passed in St. Louis Park regarding “Jitney buses.” The word jitney may have meant that the ride cost a nickel. Airport Taxi, at 6525 Oxford, appears in the 1999 Park directory. By 2001 it had become Airlink Taxi. Flash Taxicab was based in Robbinsdale, but was owned by William D. Dover, who lived in St. Louis Park. In 1948 – 1950, cabs would go back and forth between the two communities. The dispatcher’s office was in the Metropolitan Building in downtown Minneapolis. Golden Valley Radio Cab was owned by Alfred W. Hay, 3114 Noble Ave. in 1951. Hay also owned the St. Louis Park Radio Cab Company (see below). Kirk’s Reliable Taxi first appears in the Park directory in 1993. In the 1996 directory the ad says that the company has 22 years experience. By 1999-2001 it has become Kirk’s Reliable Town Car Service. Liberty Cabs advertised in the 1937 directory. It was “100 Minneapolis owned.” Also in the book was the Edina Auto Livery at 50th and France. R & C Cab Company apparently served St. Louis Park in 1955. The St. Louis Park Cab Company was in business in 1940-41. Names associated were Paul Jones and Bill Chowning. In 1951 it was listed at 5900 Excelsior Blvd. The next year this site became a gas station. SLP Radio Cab is just barely visible at the extreme right of this photo of Minnetonka Blvd. from about 1951. In 1954 it was listed at 3416 Louisiana Ave. (now Library Lane). 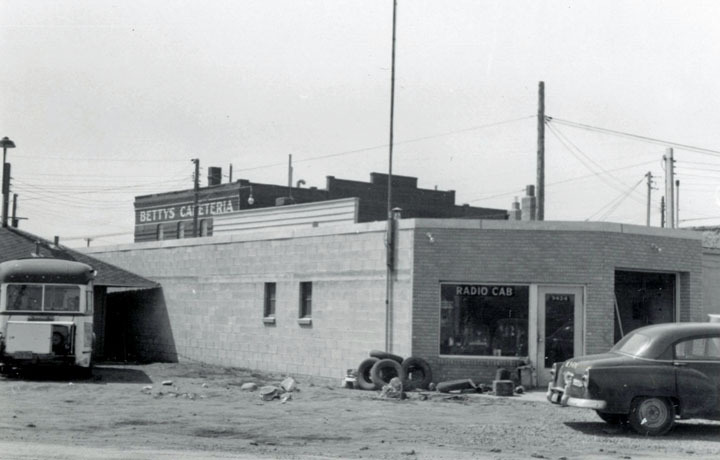 In 1956-58 it was listed at 3424 Louisiana Ave. (now Library Lane) and referred to as just Radio Cab. In 1960 Hay apparently merged the company with his Golden Valley Cab. Co., then located at 5515 County Road 18 (now Highway 169). It was listed that way in 1961 as well, and not listed at all in the 1962 directory. Suburban Yellow Cab, a national outfit, received 15 licenses in 1970, over the objections of Town Taxi, which had 34 cabs. Yellow Cab had new checker cabs, according to President John F. Daly. In 1970 the company was listed on First Street NE in Minneapolis. Suburban Yellow Cab applied for licenses for 50 cabs in 1983 but was at least initially turned down. Another company called the Other Cab Co. was also turned down for 30 licenses. At the time, Town Taxi was the only company licensed in the Park. 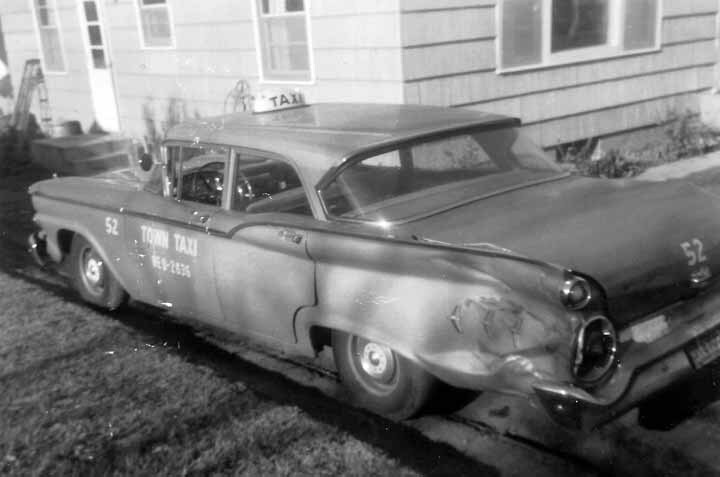 Town Taxi, owned by Leslie R. Johnson, would come on the scene in January 1957, driving light blue 1957 Fords. The address of the company was listed as 1835 University Ave., with a Midway phone number, but the ad in the St. Louis Park directory said it was 100 percent locally owned, stationed the in Park Only, serving the St. Louis Park area with 24 hour radio service. Photos and information about Town Taxi courtesy Rick Peterson, son of Charles Peterson. By 1960 Town Taxi had been purchased by Charles Peterson, and the address given as 3226 Brunswick Ave. through 1962. This was the Petersons’ home, complete with radio tower; wife May ran the dispatch duties. 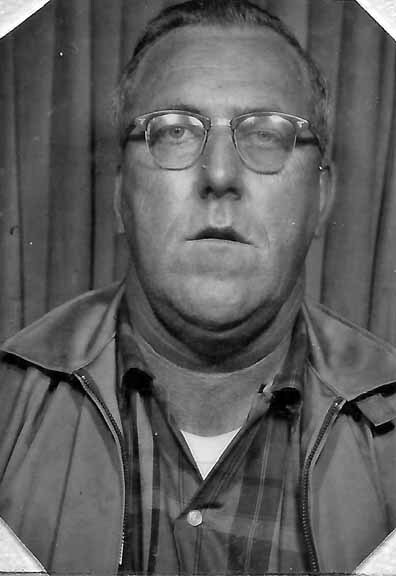 Below is the photo of Peterson from his 1965 Golden Valley Taxicab Driver’s License. Drivers had to have licenses for every jurisdiction they drove in. Town Taxi car 52 after a wee crash, January 1962. 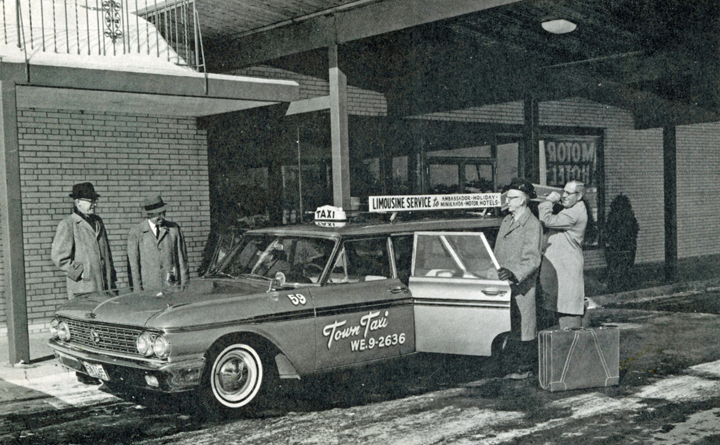 In February 1962 the company began a limo service to the airport, the first in the suburbs. Stops were the Ambassador, the Holiday in Golden Valley, and the Minikahda Inn at France and Excelsior Blvd. (later known as the Ambassador East). The company used two 9-passenger station wagons for his nine runs each day, charging $2 instead of the $5.50 cab rides usually cost. In addition, local residents could park at the Ambassador and use the service. In 1963 Town Taxi’s address was 3416 Louisiana Ave. (now Library Lane). Is it a coincidence that this is an address of the old Radio Cab in the ’50s? In 1964-67 the address was 2240 Edgewood. The June 9, 1966 issue of the Dispatch announced that Town Taxi was to offer airport limousine service starting June 13. (But see 1962.) The company planned to operate three limousines from the West Minneapolis area to and from the airport on a half-hour or hour schedule daily, at $2.75 per person. This replaced a meter charge that could go as high as $7. H.C. Bierbrauer, manager of Town Taxi, said that the cars would serve the Ambassador Motor Hotel on Highway 12 and 100, travel west to the Hyatt Lodge on Highway 12 and then south to the Hopkins House on Highway 7. The final stop would be at the Tremont Plaza in Hopkins before heading for the airport. Town Taxi also offered metered cab service to St. Louis Park, Golden Valley, Hopkins, Morningside, and Minnetonka. In 1968-69 Peterson sold the company and it was moved to 7440 Oxford Street, with 24 hour taxi service in the Park. “We go anywhere in the Greater Twin Cities Area.” 1974 was the first year to offer air-conditioned cabs. There were no listings in 1983-84. In 1985-88 Town Taxi was back in the Park directory, accepting all major credit cards and listing its address as 2812 University Ave. SE in Minneapolis. In 1986 it advertised over 30 years of service. In 1987 the directory ad said it served the entire seven county metro area. Town Taxi is not listed from 1989 to 1991, but reappears in 1992 at 2500 Washington Ave. N in Minneapolis. And that is the last we see of it in St. Louis Park directories. Urban Radio Cab was listed in 1963 at 3515 County Road 18, serving St. Louis Park, Golden Valley, Robbinsdale, Crystal, and Brooklyn Center, plus airport limo service. In 1964 Urban Radio Cab was listed at 1201 Turner’s Crossroad, serving the same areas as listed in 1963. Prompt service in St. Louis Park, Morningside and Minneapolis. Radio towers located both north and south assuring you prompt service. 80 cab stands at convenient locations permits us to give you prompt service when you call. New fleet of limousine taxicabs, roomy and comfortable 7 passenger limousine models. For your protection ride the best, responsible and fully insured. 40 years of continuous cab service.